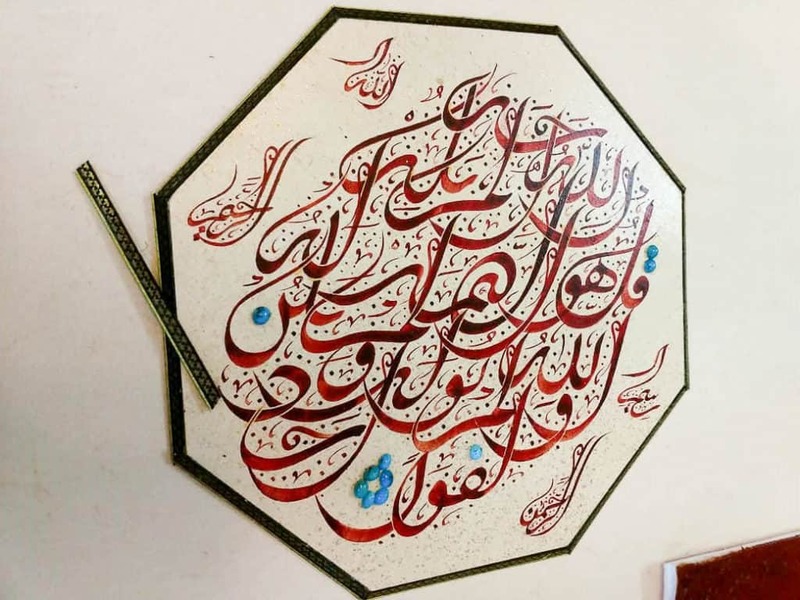 A new work of calligraphy from Reza Safavi reflects one of Iran’s classic spiritual texts. 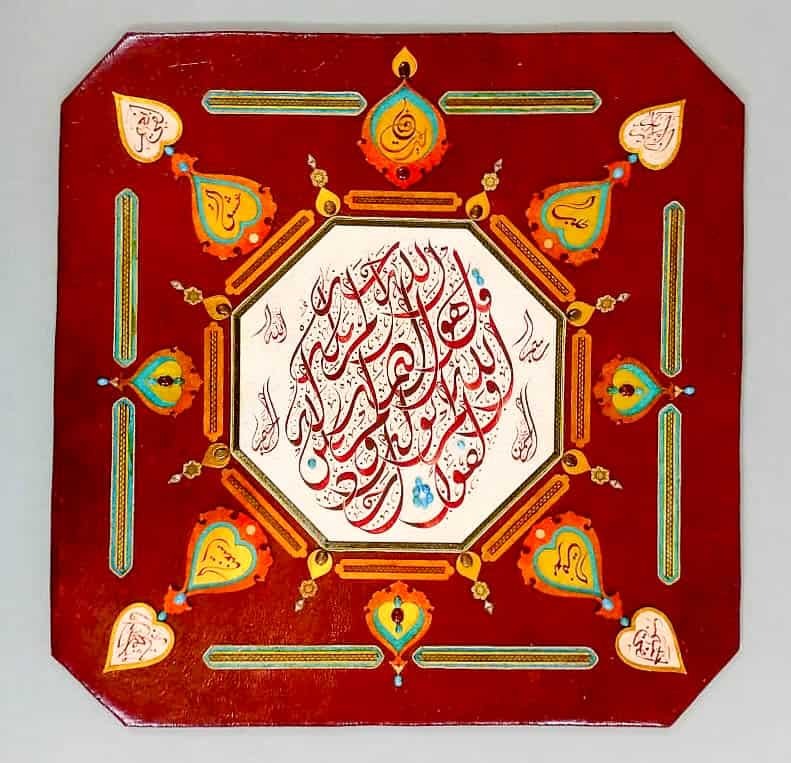 Story behind it: reminding and promoting the mystical thoughts and teachings of Attar of Nishapur; reviving the traditional gem-studding and proving its capacity for joining to modern collage art. Procedure: 1. initial sketching; 2. cutting brass plate with a buzz saw and filing and polishing; 3. redesigning with cut-out motifs and final composing according to the concept of work; 4. assembling the gemstones and brass pieces on the main chassis (made of leather and paper); 5. applying insulating material to the surface; 6. pressing 7. Framing. This recent work of master Reza Safavi has been performed as a commission of the Cultural Heritage, Handcraft and Tourism Organization in Mashhad. 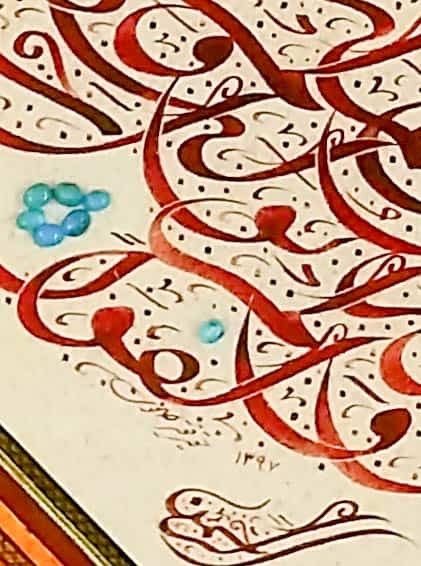 The calligraphy in the centre of work is Sūrat al-Tawḥīd, which refers to the fifth valley of the seven valleys in Attar’s book (the Conference of Birds). The other ones are the names of the valleys.